Pinay WAHM: April Fool's Prank??? 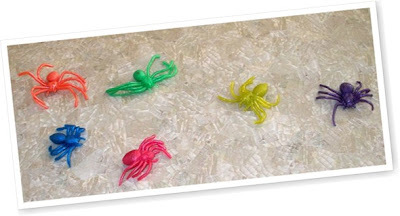 These are the little one's toy spiders that are supposed to scare the wits out of Mommy. Did it work? Not by a long shot but I just find it funny she even tried. She actually put 2 of them by our bedroom door - the green and the purple ones - to 'probably' make me jump. I had to burst her bubble and tell her that I don't think there is such a thing as a 'purple spider'. She's still happy though because she likes to 'observe' every 'special occasion that's known to man...April Fool's day included. Have you had a successful April Fool's Day prank? I did, once. It's one that we played on our students when I was still teaching in Taiwan. We called students over the intercom asking them to go to the Principal's office just for the heck of it. We know how it is being called in the Principal's office, don't we? The students we played the pranks on were good natured students so we all got a good laugh out of it afterwards. I think that's the only time I actually pulled a prank on anyone on April Fool's Day. It's not really big where I came from that I didn't even know what it was until I was an adult already. Ahh...the joys of being a 'probinsyana'. Thursday pa lang noh!!! BWahahhaa. Happy April Fools day. I know you won't be fooled. We can't fake Fridays!!! Woohoo! At marunong din mag-prank joke si E! Kung pinagtulungan nyo na lang kaya si Daddy?! Enjoy to the max ang April fool's day ni E! he he..
Kakatuwa namn yung anak mo sa pag scare sayo ng colorful spiders! hehehe!